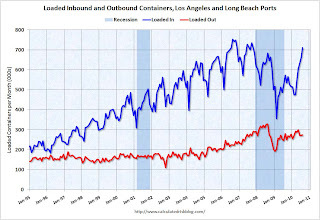 The following graph shows the loaded inbound and outbound traffic at the ports of Los Angeles and Long Beach in TEUs (TEUs: 20-foot equivalent units or 20-foot-long cargo container). Although containers tell us nothing about value, container traffic does give us an idea of the volume of goods being exported and imported. Loaded inbound traffic was up 24% compared to August 2009. Inbound traffic is now up 4% vs. two years ago (August '08). Loaded outbound traffic was down 2.6% from August 2009. Unlike imports, exports are still off from 2 years ago (off 17%). For imports there is usually a significant dip in either February or March, depending on the timing of the Chinese New Year, and then usually imports increase until late summer or early fall as retailers build inventory for the holiday season. So part of this increase in August imports is just the normal seasonal pattern. Based on this data, it appears the trade deficit with Asia increased again in August. Not only have the pre-crisis global imbalances returned, but exports appear to have peaked in May (no clear seasonal pattern), and have moved sideways or down over the last 6 months.